I have long admired those who could embrace and execute a dark, rich and moody interior colour scheme, writes Interior Designer and one-half of Michael and Carlene (The Block Glasshouse power couple), Carlene Duffy. It takes a certain amount of courage to step outside the square that is a light and white interior. My first opportunity to have a crack at ‘the dark side’ was as a contestant on The Block. In hindsight, going deep and moody in this situation was pretty risky given the stakes but as an avid Block viewer, I was tired of looking at stark white interiors with half-hearted pops of colour, over and over and over and over. I wanted to create a look that was memorable, that set us apart, and that inspired viewers to be bold, to go to the dark side. I actually didn’t go into the competition with a preconceived dark interior colour scheme but I was given a big hefty nudge because of the particular apartment assigned to us. You see, we were designated a south-facing apartment with poor natural light. Two of the bedrooms only had windows opening onto a terrace with an open roof. So rather than fight an uphill battle and try and make my apartment seem lighter and brighter, I embraced the hand we were dealt and worked with what we had. What many people don’t know is that unless you are working with a space with an abundance of natural light, you should never paint your walls white because it will appear wishy-washy and cold. Always use saturated colours in an interior with low light levels. When we were working on our first Block bedroom we were pretty dispirited by the lack of natural light because at this point the terrace coming off the room wasn’t built and the room had absolutely no natural light. We installed as big a skylight as we were allowed with some improvement. 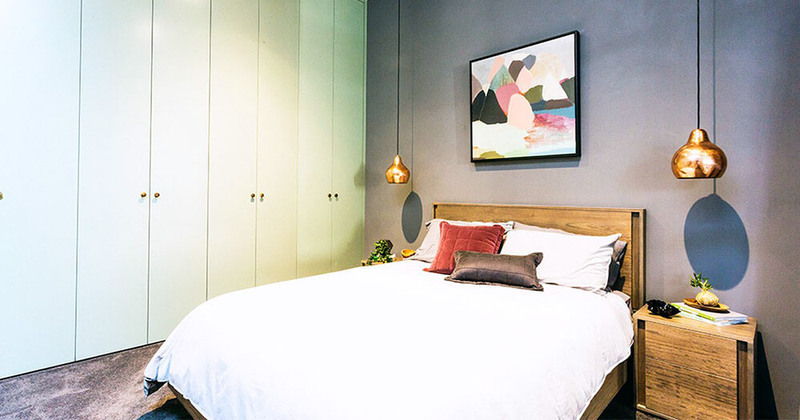 And from there we opted for rich colours with sage green cabinetry, a medium grey wall colour and timber bed and bedside tables. Timber is key for creating warmth especially when the light level is low. Bedroom number two was our only bedroom with an opening onto the street and was, therefore, our lightest bedroom. 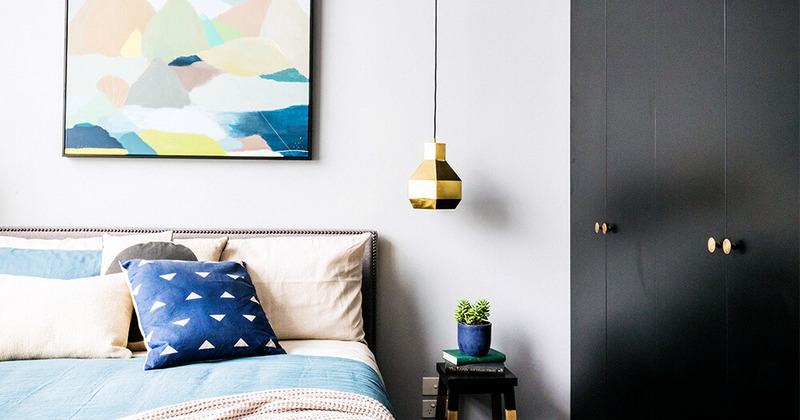 I took advantage of this by painting the walls a much lighter grey but pairing it with black cabinetry, the bedroom was still in keeping with the mood of the apartment. 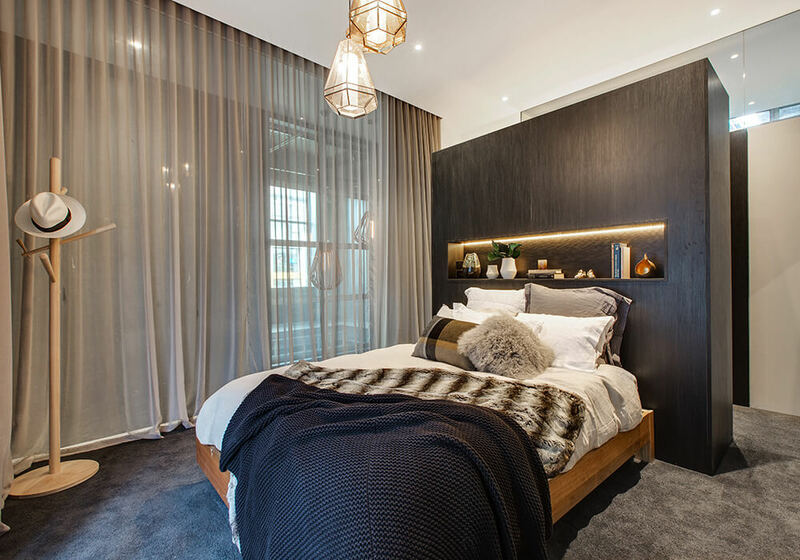 The master bedroom was our third and final bedroom to deliver on the show and it was important to me to create a real sense of maturity and luxury in this space. Again, the only window opening in the architect’s plans was onto the semi-enclosed terrace and whilst we added another large window over, the light level remained low. We weren’t perturbed. We opted for black joinery again but this time in a timber grain for added texture. We went with a light grey on the walls for a neutral other than white. Light and shade are important in an interior and the light coloured bedding with a mix of stone, ivory, and greys contrasted the black joinery whilst keeping the room tonal. The pops of brass in the lighting and accessories are enough to add a lift and a touch of glamour. The proof is in the pudding; we were able to create three successful bedrooms, with a rich and moody colour scheme. The moral of the story is work with what you have, rather than against it. Be brave, be bold and be different and you might be pleasantly surprised by the outcome. See more of Michael and Carlene’s The Block Glasshouse apartment here. If you love The Block and all things Interior Design and Decoration, read Carlene Duffy's latest articles here.